It was only 35 years ago that Rose-Marie and Eijk van Otterloo began collecting – buying horse carriages at country auctions for a farm they owned in New Hampshire. "When the barn was full, we started buying English sporting prints," says Mrs. van Otterloo. About 20 years ago, they switched to Dutch and Flemish Old Master paintings. Now they are the most important collectors of those works in the United States and among the top in the world – and they're still acquiring. Their treasures include Rembrandt's beautiful Portrait of Aeltje Uylenburgh, Aged 62, and works by Franz Hals, Jacob Van Ruisdael, Jan Brueghel the Elder and Jan Steen. "I don't know of an equal [private collection]," says Arthur K. Wheelock, Jr., curator of northern baroque painting at the National Gallery of Art in Washington, D.C. Experts rave about the choice, the quality and the condition of their 70 works – not to mention the roll call of the artists. The collection is worth an estimated $200 million to $300 million, though the couple declines to discuss the subject of value. Next year, the world will have an opportunity to judge. "Masterworks from the Van Otterloo Collection" – about 65 of the couple's paintings – will go on view at the Mauritshuis in The Hague, then travel to the Peabody Essex Museum in Salem, Mass. Possible other venues include the Museum of Fine Arts, Houston, and the Los Angeles County Museum of Art (LACMA). The couple has lent works to many exhibitions over the years – about 20% of their paintings are currently on display in museums, including the Rembrandt portrait, which is now at the Boston Museum of Fine Arts (MFA) – but this is the first show to focus on their collection. In an exclusive rare interview, the van Otterloos talked for the first time about their art. Sitting in the dining room of their home in Marblehead, Mass. – an elegant, unostentatious, traditional (but climate-controlled) home on the water – they told how their initial ad-hoc purchases evolved into a highly organized, disciplined historical showcase – a model of collecting. They mentioned a regret or two, assessed what else they need to buy, and hinted at the collection's future in the public domain. Among dealers, the van Otterloos are known as careful, knowledgeable and deliberate buyers who wait for years until the right painting is available. The Rembrandt, owned by the Rothschilds for three generations and considered to be one of the finest in private hands, is one example. It all started with a monumental change in focus, which occurred when Peter Sutton, a well-know expert on Dutch art who is now director of the Bruce Museum in Greenwich, but was then a curator at the MFA, asked the van Otterloos a question: "Instead of carriages and prints, why not, with your backgrounds [Eijk is Dutch and Rose-Marie is Belgian], collect Dutch and Flemish paintings from the 17th Century, the Golden Age?" "So we bought our first at Christie's, a Jan van Goyen, which we still have," says Mrs. van Otterloo. Then, continues Mr. van Otterloo, Sutton told them about a picture at Haboldt & Co. Bob Haboldt brought Nicholas Berchem's "The Stag Hunt," about 1665, to them, and they bought it. And then, they recall, "Peter called, and he said one is a picture, two is a collection." They were off. They recall being "very nervous buyers" at first. They'd go to auction house exhibitions, "pick up the buzz," and feel remiss. "You'd say, 'I don't see what they're seeing" and you think you know nothing, and relative to a lot of experienced buyers, we did know nothing," says Mr. van Otterloo, co-founder of Grantham, Mayo, Van Otterloo & Co., an investment firm started in 1977 that manages more than $75 billion. A year or so into their serious collecting, a big revelation occurred. They were considering an enormous painting by Joost Cornelisz Droochsloot that was being deaccessioned by the MFA in Boston. "I thought if it comes from the MFA, it must be good," Mr. van Otterloo explains, "but when I asked Peter, he said 'don't touch it.' " Mr. Sutton stood with him in front of the picture and asked what he saw – "and that's where I learned about condition," Mr. van Otterloo recounts. The painting was on panel that had been separated, shaved a few millimeters and rejoined – leaving slight but noticeable irregularities. "That was a very valuable lesson," he says. "That taught us that we needed more than [our] two pairs of eyes. We needed expert advice." Sutton would have played that role had he not joined Christie's – creating a conflict of interest. As it happened, the van Otterloos had recently met Simon Levie, former director of the Rijksmuseum, at Jack Kilgore's booth at TEFAF-Maastricht. They enlisted Levie as their advisor, paying his scouting expenses and a percentage fee on the works they purchased (they declined to say how much). The van Otterloos recognized that the payment scheme "puts the incentive in the wrong place, on volume," but say it didn't work that way. "We had the [collecting] bug by then," says Mrs. van Otterloo. "If anything, he [Levie] held us back – he would say, 'this is not the right painting.' " To guide them, Levie wrote essays on each work he proposed for purchase. In 1997, Mr. Levie suggested an evalutation of the couple's collection: they had bought intuitively, beautiful works that would fit in their home – and mostly landscapes. They agreed, and asked Mr. Levie to write a memo focusing on the future direction of the collection. "My personal goal was to equal the Carter collection in Los Angeles," says Mr. van Otterloo, reaching for a catalogue of the works owned by the late Edward W. Carter, a founding president of LACMA, and his wife Hannah. The Carters had, beginning in the late '60s, amassed a quiet, eye-pleasing collection of cabinet-sized paintings that was, Mr. Wheelock says, "renowned for its uniformly high quality paintings in extremely good condition." The collection, 36 works, was given to LACMA in 2003. The van Otterloos asked Mr. Levie to cover all the themes of 17th-century Dutch and Flemish painting and tell them where their collection had gaps. At the time, they owned about 25 works. "He came back with a list that added up to 66 paintings, including those we owned," says Mrs. van Otterloo. Mr. Levie pointed out that they owned no portraits, no female painters, and so on. "We looked at his list, and said, this is absolutely right." "From then on, we started looking more systematically," says Mr. van Otterloo. They set their sights on those gaps – seeking church paintings, seascapes, cityscapes, portraits and so on. And they resolved only to buy the top works by an artist, "not the one he did on a Monday with a hangover," says Mrs. van Otterloo. They wanted a major work by all the important artists. With Mr Levie's help, they devised a strategy for their collection and decided to sell 18 works that no longer fit their goals. They started seeking specific kinds of works that illustrated different aspects of common Dutch genres such as still lifes, landscapes, domestic scenes, church interiors, seascapes, works by women artists. "They've done it in a way that they can give you a history of the painting type," says Mr Sutton. For example, a Willem van de Velde (the Younger) seascape shows a vessel struggling in a stormy sea; a Simon de Vlieger work depicts a choppy sea with sailboats keeling strongly to leeward; a Jan Porcellis painting shows another choppy sea, but is unusual in that it also includes a rainbow in the composition. Next come two scenes showing calm, unrippled waters, one by van de Velde again, another by Jan van de Capelle. They own a river scene by Ludolf Bakhuizen that shows Amsterdam in panorama. Finally, they own what Mrs van Otterloo describes as "a small but well preserved example of a pen painting by Willem van de Velde the Elder." As with these seascapes, they can show the development of each genre they collect, says Mr. Sutton. With major artists, the van Otterloos sometimes buy more than one work, but they strive to have dissimilar ones. For example: They own three Jacob van Ruisdael paintings – a winter scene, a forest scene and a panorama. "That's really thoughtful," Mr. Sutton says. "Simon gave them a framework which thinks about art history, and they obviously care." The couple's biggest move came in 2001, when they decided they wanted to buy the Rembrandt, which was on sale at Robert Noortman's booth at the European Fine Art Fair in Maastricht that March. Noortman, who had purchased the painting at Christie's in London for $28.7 million in December, 2000, was asking $36.5 million. The picture had come from the estate of the Baroness Batsheva de Rothschild. In fact, the van Otterloos had gone 50-50 with Noortman when he purchased it at Christies. They wanted to own the work, but "it was a big number," he says. To raise cash, they decided to weed their holdings. They asked Mr. Levie and Frederik J. Duparc, then director of the Mauritshuis, now their advisor and curator of the upcoming exhibition, to make a list of up to 20 paintings they could "let go" to buy the Rembrandt. When they compared the two lists, there was only one disagreement – and none with their own list of 18 paintings. They sent all 18, including works by Jan van der Heyden, Jan Miense Molenaer and an early Salomon van Ruisdael, to Noortman, who put them up for sale. "Eijk had more heartache about it than I did," says Mrs. van Otterloo. "Once they were gone, I thought our collection was much more beautiful, more cohesive and peaceful." He says: "I still feel it wasn't worth it." 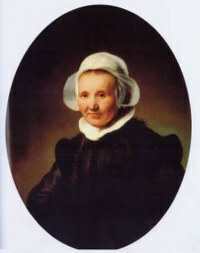 But, as Mrs. van Otterloo puts it, "the Rembrandt put a crown on the collection; it's the jewel." And it affected their collecting, which has slowed since then. "It set the bar so much higher," Mr. van Otterloo explains. "We really had to look for the best of the best, rare and more expensive works now." They have made some recent purchases. About six weeks before TEFAF in March, they purchased An Old Woman at a Meal, 1657-60, by Gabriel Metsu, from Noortman Master Paintings – but allowed him to show it at the fair, where it carried an asking price of $4.6 million. In July, they purchased a study of a young woman in profile by Salomon de Bray at Sotheby's for $1.33 million. Having studied and looked for some 20 years now, they are confident about their purchases. All along, the couple's tastes have basically coincided, though Mrs. van Otterloo remembers one disagreement. She hesitated about a painting that "he was over the moon about." 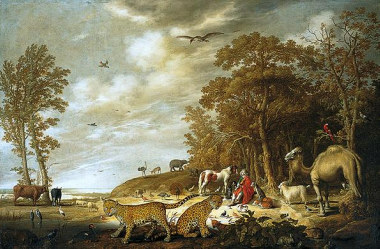 It was Aelbert Cuyp's Orpheus Charming the Animals, which they bought at Sotheby's in London in July, 1994. "I was heartsick about it," she recalls about the big, bold work with two jaguars in the foreground. Until she saw it hanging in her home. "It was a breakthrough – I called him, and said 'it was better than you imagined.'" The couple have sold a few works, mostly when they were not satisfied with the condition of a painting or when a better work by the same artist became available. They cite, as an example, a 1674 Willem van Aelst still life, with peaches, which they sold to buy a more academically correct, more painterly one made in 1647. Usually, they return the work they don't want to the dealer from whom they bought it. Although the couple continues to travel to some art fairs, to London dealers every winter, and to New York dealers when they're in the city, the works come to them now. Dealers are always calling with something special. The van Otterloos decline to talk about how much their collection is worth. It's the one question, in the course of a nearly three hour interview, that turns Mrs. van Otterloo a tad testy. "Our collection is not about how much it's worth," she insists. "It's priceless." Mr. van Otterloo, the financier, says they do not treat it as an asset: "I exclude it from my wealth, like a museum, because we have the intention to give it away someday." He is 72, she is 63 and they have told their four children that they will not inherit the works. So where will they go? They're not saying, and – in fact – they say they do not know. "One motivation for the exhibition is to get more feedback from around the world," Mr. van Otterloo says. "I want feedback from critics. It may help decide what we do with the collection." But they are not finished buying, either. They agree that their trove has holes. It has very few Flemish paintings. "We need another mythological painting," she says, as they begin to tick off more desires: A Utrecht painter. A Caravaggisti. Maybe a Ter Brugghen. A Judith Leyster. A Pieter de Hooch. These "omissions" are hard to get pieces. Then again, landing that Rembrandt – a "killer picture," according to dealer Otto Naumann – wasn't easy, either. But they waited, and they got it.